I want to begin this week by thanking you for your patience over the last couple weeks. We’ve been moving our oldest daughter into college. She is our first-born child, and we’ve felt a mixture of bittersweet emotions: business, grief, excitement, joy and sorrow. I was not prepared for what I’ve been feeling about her leaving home. Please pray for me and for us as family. We started by reading from Mark’s gospel, chapter 2. Let’s take a look at Jesus and the dinner he attended at Levi’s house. In Mark’s gospel, salvation is defined as Jesus’ liberation from all that oppresses. Mark’s Jesus is not preoccupied with getting people through life in moral condition so their post-mortem, disembodied soul is eligible for the pearly gates. Mark’s Jesus is busy liberating those he encounters from whatever oppresses them today, right now. 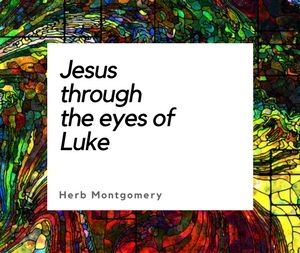 Mark’s gospel also draws from the apocalyptic, dualistic world view that connects everything here on earth with a fight between good cosmic forces and evil cosmic forces. In other words, if someone is being oppressed, their oppressors are the puppets of cosmic evil. Jesus envisioned himself as a conduit of cosmic good, here to liberate those oppressed on earth. This is why Mark jumps into supernatural acts of liberation this early in the Jesus story. Mark shows us that Jesus possessed a preferential option for the poor. Jesus wasn’t working for the equal opportunity of all to compete in a system of winners and losers. He aimed instead at a radical restructuring of human communities where there are no more winners and losers. Jesus pointed us toward communities of mutual aid, where we each strove to take care of one another rather than competing against each other. In Mark 10, Jesus tells the man, “You lack one thing; go, sell what you own, and give the money to the poor.” He envisioned community not rooted in win/lose survival, but win/win cooperation. In the second chapter of Mark, we see the wealthy tax collectors and “sinners” responding to Jesus’ call to wealth redistribution and the wealthy Pharisees not responding well. We begin here to see in Mark’s gospel a Jesus who prioritizes liberating the oppressed over religiously defined purity and fidelity to religious ritual. The Pharisees in Mark are upset that Jesus is eating with “tax-collectors and sinners.” Jewish tax-collectors were viewed as unfaithful to the national interests of their own people and collaborators with the oppressive political and economic power of Rome. A sinner in the gospels was someone perceived to be living contrary to the Pharisees’ and teachers’ interpretation of the Torah. Notice that those who were thought to be guilty of nationally infidelity and/or religiously disobedient were responding to Jesus’ economic teachings, yet the Pharisees, who valued national faithfulness and strict obedience to the Torah’s ritual and purity laws, were not. Mark offers another clue to understanding what’s happening in Mark 2. In the next two stories in his gospel, Mark focuses on the Pharisees and the rituals of fasting and the Sabbath. Asked about the Sabbath, Jesus responds, “Have you never read what David did when he and his companions were hungry and in need of food” (Mark 2:25). The Torah declared it was not lawful for anyone but the priests to eat the bread of the Presence. But when it came to feeding the hungry and strict adhering to the ritual laws, Jesus chose to labor for the oppressed and to prioritize feeding the hungry over the Torah rule. The people were a weightier matter than the law. Mark’s Jesus prioritizes the lives of those who are being economically oppressed. Following Jesus is not about greater patriotism to nationalistic interests, nor is it primarily about religious observances. Following Jesus means defining salvation not as getting to heaven but as liberating humanity today from all things that oppress and using the principles Jesus taught himself. Those who participate in this liberation work are, by definition, following Jesus in his work. Those who don’t may be very religious, yet are not following him in the way he walked while here on earth. 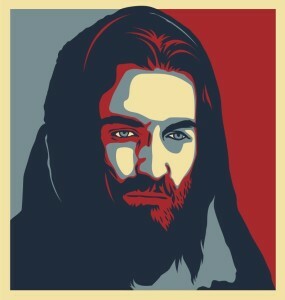 I believe Jesus was using the religious leaders’ own paradigm here. They felt they were “righteous,” and called those Jesus embraced “sinners.” Yet Jesus took on the role of a liberating physician, and those labeled “sinners” and “sick” were responding to him. They were the ones seeing the sickness of the system they’d participated in. They were the ones choosing to move in a different direction. Jesus hadn’t come to affirm or reward those who were “righteous.” He had come to heal the sick, to liberate the oppressed. Jesus suggests to the religious leaders that even if they were more politically “righteous” than the tax collectors and more ritually “righteous” than those they referred to as “sinners,” they were just as much economic “sinners” as the wealthy tax-collectors, and just as much in need of liberation as the people they condemned. As long as they refused to consider this reality, they could have no part in and no understanding of Jesus’ work for the poor and oppressed. This week, don’t ask yourself how successful you are in the merely religious aspects of your life. Ask yourself what you and those around you need to be liberated from so you can be fully human. Ask what you are doing in your own sphere to live out Jesus’ liberation. Just recently, someone responded to one of my critiques of social political and economic abuses. “What are you, Herb,” they asked me. “A minister or a politician?” My response is that I’m neither. I am simply a human being endeavoring to obediently follow Jesus. And it is that obedience that dictates that I must concern myself with more than the afterlife. I must also concern myself with whatever people need liberation from today in order to be what the great Heart at the center of the universe brought them into existence to be. To the degree that we’re living out Jesus’ ministry of liberation from all things that oppress, to that same degree we’re working alongside Jesus. Unless we live out the wisdom of the Jesus story, we may still possess some assurance that helps us sleep at night, but we’re not following Jesus’ way. If our Jesus today is not first and foremost a liberator of the oppressed as he declared in Luke 4:18, then we must at least ask whether our Jesus is the same one the gospels describe. The Jesus story calls us to fundamentally rethink theology from the standpoint of the poor and oppressed, to envision a God who is on the side of the poor and the oppressed of our world. The Jesus story calls us away from being preoccupied with getting people through life in good religious or moral condition so that when they die they can be admitted into heaven. Hope of a post-mortem Heaven, dear as it may be, cannot be our cause for excluding or ignoring the basic conditions anyone lives in today. The Jesus story calls us to ask, “What do we need to be fully liberated from in order to be fully human?”—and that liberation is physical, economic, political, religious, and social. What do we and those around us need to be fully liberated from? Sit down with your HeartGroup and take inventory: what in your everyday lives do each of you need to be liberated from? List the issues, experiences, or needs. Brainstorm ways the group can come together along side of those needs, and live out the liberation values of the Jesus story. Write them down. Pick three things you have written down in number 2, and coordinate the carrying out of the actions previously discussed. Charity addresses our immediate needs, but justice gets at the root of what is causing the oppression. Again, the Jesus story defines salvation as liberation from all things that oppress. Within the teachings of Jesus are the seeds of how we can embody Jesus’ work of healing in this world (see John 3:17). His teachings are where a Jesus follower begins to discover how we live out this gospel in our community and incarnate the values of this story which we hold dear. Here’s to Jesus’ safer, more compassionate home for us all. I wish each of you much love, peace and liberation this week. I love each one of you and I’ll see you next week.